Big things are happening at LinkedIn, with the business-oriented social network unleashing a new site which aims to be a fully stocked education and training hub. LinkedIn Learning is an online education portal which wants to help users (and their bosses) identify the skills they need to master, and then deliver courses to help train them in said skills – courses hosted by experts in the various fields available, many of which will be drawn from Lynda.com (which LinkedIn acquired in the spring of last year). Staff members will be able to choose the courses which interest them, and also their managers can recommend training sessions they believe are suitable for employees. There are over 9,000 courses available on-demand, hosted by 800+ industry experts, and pitched across all manner of topics including the likes of project management, risk-taking, winning the battle against red tape, and so on, as you can see in the sample selection below. ‎Ryan Roslansky, Vice President, Product at LinkedIn, commented: "We know the useful shelf life of professional skills has shrunk to less than five years. There is a critical need to help people acquire new skills through a highly personalised, data-driven and engaging learning experience. And we couldn't be more thrilled to fill this need with LinkedIn Learning." 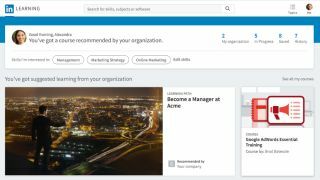 You'll need to be a LinkedIn Premium subscriber to access this service, though, and TechCrunch reports that you'll be able to take 25 courses per week – although there will be a business subscription option allowing companies to enlist their entire staff. As well as LinkedIn Learning, other moves are afoot at the social network which now has in excess of 450 million users, including a redesign of the desktop experience – with the fresh look having been influenced by the mobile app, as you can see in the image below. The basic idea is to offer something with a more streamlined and cleaner look that's simply more intuitive to use. Roslansky called this the "largest redesign since LinkedIn's inception", and noted it was the foundation for the future of the social network. The redesign is in the pipeline and will be coming "soon", alongside tweaks to the newsfeed to better serve up more relevant content and trending news to users, and to make it smarter in general. Finally, LinkedIn also has plans for the introduction of bots to its messaging platform, mentioning the likes of an assistant which could help you schedule a suitable time for a meeting. As you doubtless saw back in the summer, Microsoft snapped up LinkedIn and we discuss the reasons why the software giant made the move in this article.